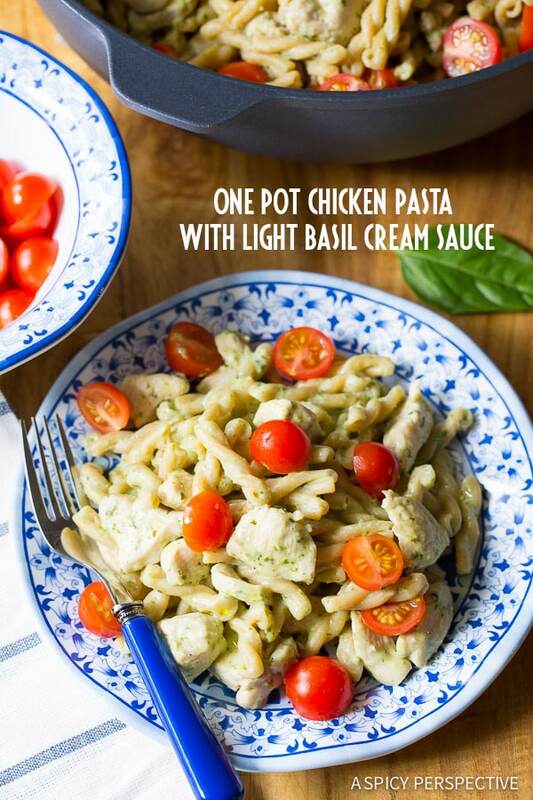 Easy One Pot Chicken Pasta with Light Basil Cream Sauce – the perfect dinner for pasta lovers who are watching their waistlines! Looking for a quick comforting dinner idea? Want to make it in one single pan for easy clean up?? Oh yes… and you want it to be healthy for your family??? 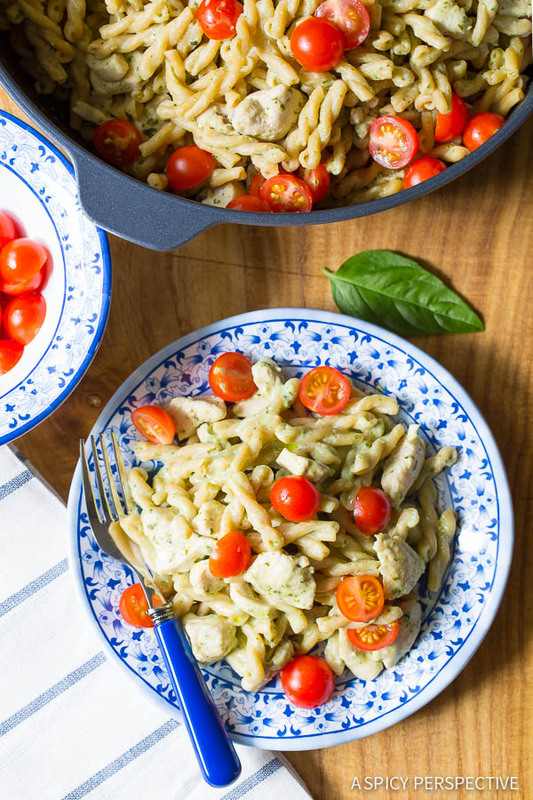 Today’s One Pot Chicken Pasta with Light Basil Cream Sauce is a win-win-win. It’s soooo cozy and delicious, with whole wheat gemelli twists, tender morsels of chicken, and a silky herbaceous cream sauce that tastes decadent, although it’s not. 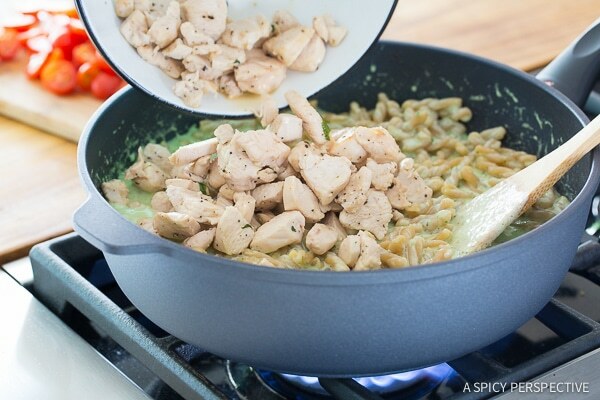 Start this One Pot Chicken Pasta with Light Basil Cream Sauce by sautéing chicken pieces for a couple minutes. We’re not trying to cook the chicken through here, because it will go back in the pan later. 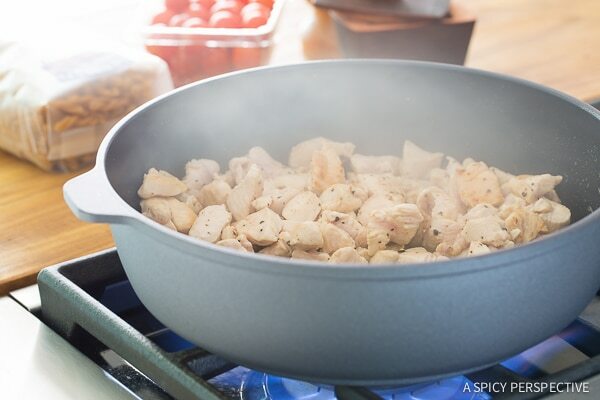 Remove the chicken and add the pasta to the pan with 3 cups of water. 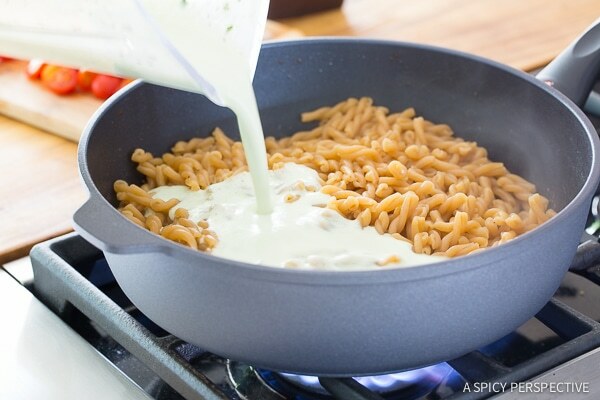 Cover the pan and allow the pasta to simmer until all the water has absorbed…. the pasta won’t be quite cooked through either at this point. Then puree low fat milk, light sour cream, fresh basil and garlic together into a creamy sauce. Pour the basil cream sauce over the pasta and toss to coat. Allow the pasta to simmer a couple minutes before adding the chicken back to the skillet. Then toss in the chicken, and simmer another 2-3 minutes until the sauce thickens. Voila! See how easy that was? I like to add fresh grape tomatoes to the pasta when it’s finished cooking to add a bit of color, sweetness, and fresh juicy pop! 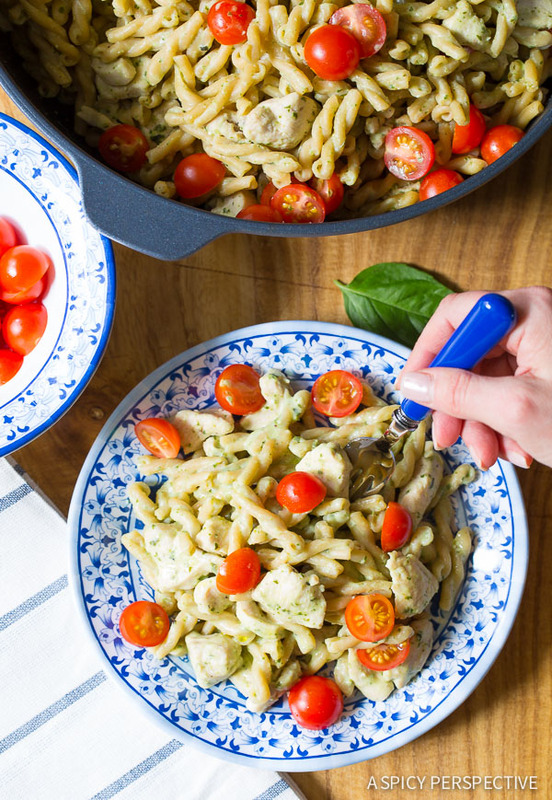 Our One Pot Chicken Pasta with Light Basil Cream Sauce is so easy to make, it might become a “regular” on the dinner schedule. Heck, your kids might even be able to make it themselves. 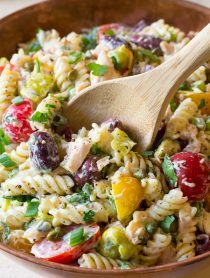 And they’ll love serving this light and healthy pasta dish on gorgeous, yet crack resistant, Q Squared NYC dishes. We are crazy over our Q Squared dinnerware (and flatware) because they come in so many fabulous patterns, and we never have to worry about the kids “helping” with dinner and clean up. And we love them even more when they are piled high with luxurious, yet easy to make, pasta dishes like this one! 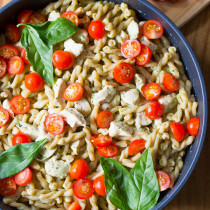 Easy One Pot Chicken Pasta with Light Basil Cream Sauce! The best one pot pasta recipe we’ve ever made. 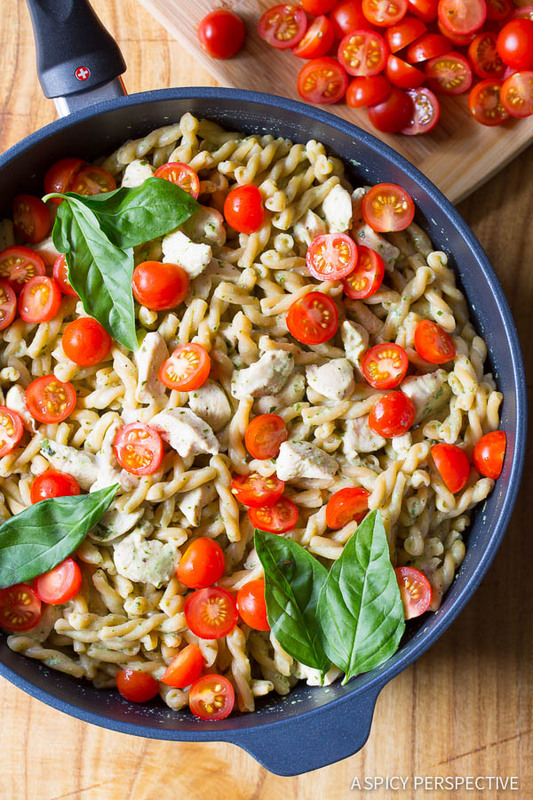 Loaded with tender chicken, fresh tomatoes and basil. Add the pasta to the skillet and cover with 3 cups of water. 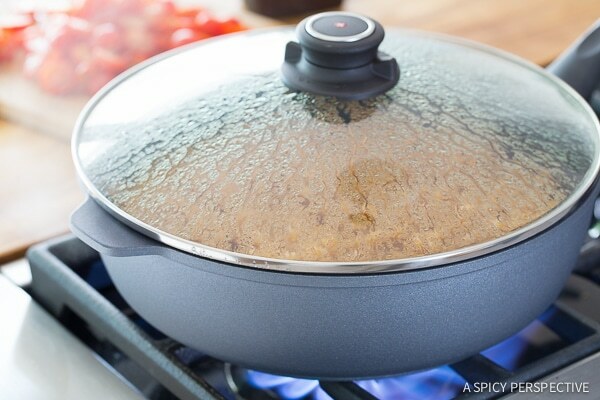 Place the lid on the pan and simmer until the pasta has absorbed all the water and is almost cooked through. Meanwhile, place the sour cream, milk, basil and garlic in the blender. Cover and puree until very smooth. Once the pasta has absorbed all the water, add the cream sauce to the pasta and stir to coat. Simmer for 2 minutes, then add the chicken back to the skillet and simmer another 2-3 minutes, until the chicken and pasta are cooked through and the sauce has tightened a little. Salt and pepper to taste. Remove the skillet from heat. The sauce will continue to thicken as it cools. Toss well, then add the tomato halves to the pasta. Serve immediately. 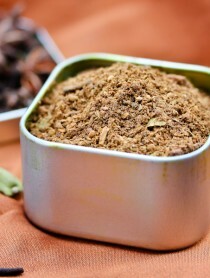 I really want to make this but want to use dried basil. Is this a no no? I’m afraid you wouldn’t end up with the right taste or texture. It’s probably better to buy some fresh basil for this. Is there a reason why you just don’t boil/drain the pasta? Sounds delish and would love to try it, but think it would be easier to use the traditional method? Thanks! Thank you so much, Sommer! :-) Can’t wait to try it! Quick pasta meals are my favorite thing to make for dinner. If I could get away with it, it would be pasta every night! 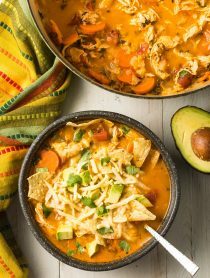 I love a one pot meal and this one looks delicious! Great pasta dish! I love how easy it is! Stunning photos! I’m needing this pasta right now!! If you waistline-friendly and pasta WITH cream sauce in the same sentence, well, I sort of love you. This looks like the perfect spring dinner that will still allow me to not stress about bikini season. WIN! Pinned!